Judy Klaich Zetz Peters, my distant relative and traveling companion on our Kosovo Men's Choir trip (August, 2008), purchased many of these unique patterns of crocheted pieces for her Mom and Aunts to see, as they, too, do unique crochet work. Judy said the woman selling the pieces in Belgrade almost kissed her from happiness as she purchased so many different pieces. "I think I paid her rent for the next two months," Judy quipped. The workmanship is fantastic. Either side could be used as the you can't see any seams or end pieces. First Judy bought these books so she could know more about her own Austro-Hungarian Empire -Krajina-Serbian roots. Several pairs of gloves were purchased too, each one unique unto itself. There are other handicrafts made by the Serbs. 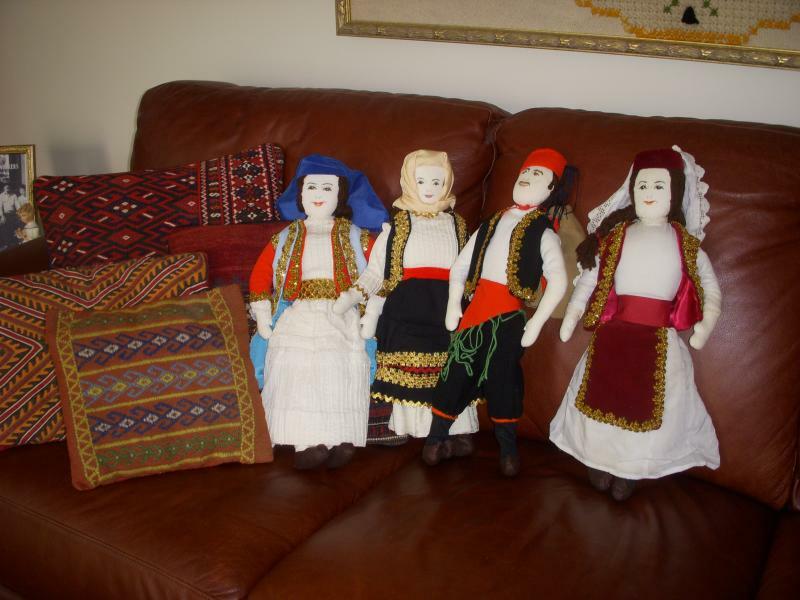 Here are a few examples of some huge (about 24" tall) handmade Serbian dolls. And how about that pillow in front made around 1934? The label says the dolls were originals made by the Serbian Artists Studio. 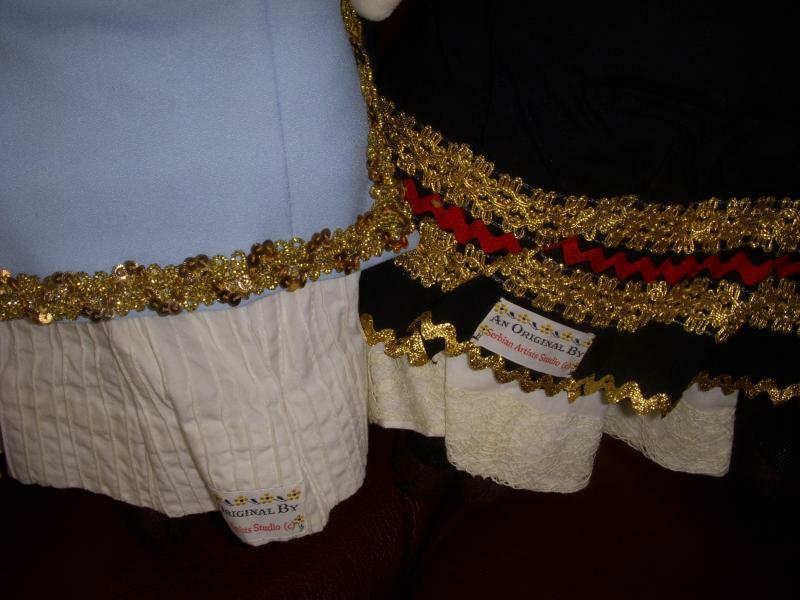 Even the cloth skirts were like the original "narodna nosinje" costumes! These dolls were a gift to me from my neighbor, Avery Kaminsky. Great find, Avery! Grand-niece Amelia and her American (Serbian) doll, she has named "Olivia." 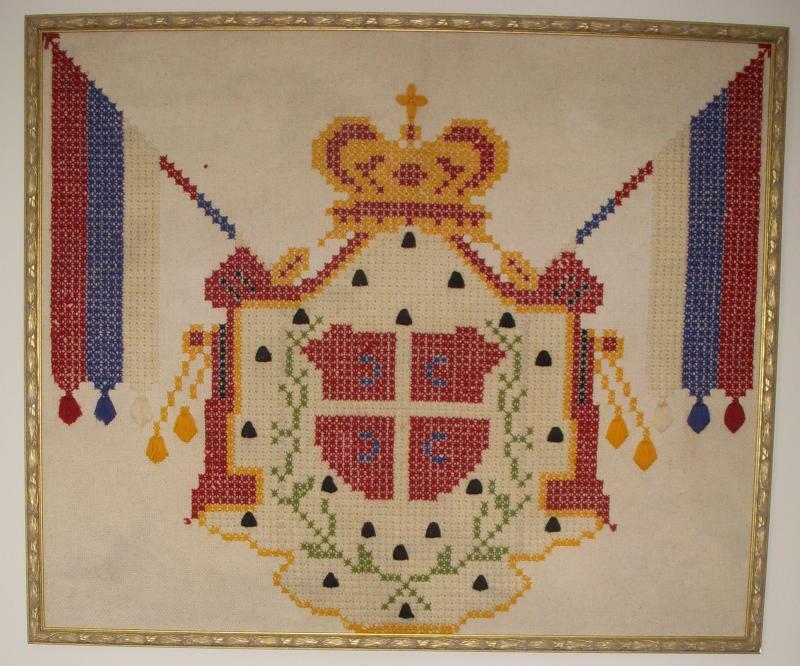 This "St. George" peskira (long towel decorated on each end with embrodiery and crochet at the bottom), was a gift to Mim from her husband's relative, "Dragica," in Virgin Most during a 1988 visit to the Krajina area of Kordun. It has been used to carry the "kolach" (sweet bread) to church on St. George's Day, May 6th, each year ever since. The Serbs from the Krajina (now Croatia!) are known for their magnificent needle skills. 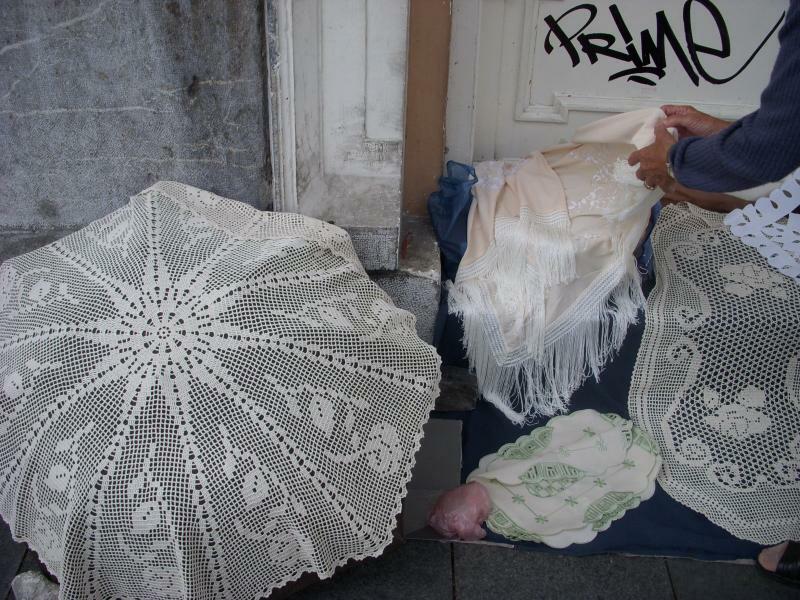 Several decorated tablecloths of Saints have been purchased from several of the more than 250,000 poor Serbian refugees from the Krajina, now living in or near Belgrade, many in the most humble of shelters. Dragica died during the conflict in the Krajina. Vjecnaja pamjat. She was so full of life when she presented this to us in 1988. Their Embroidery AND Crochet work was so Creative! I wrote a story for SERB WORLD when returning from our trip in 1988, before the tragedy in the Krajina- Operation STORM, "OLUJA," saying how I saw hundreds of these in ONE house, each one different, as part of a wedding dowry the "Zadruga" ladies in this particular Virgin Most household were preparing for a bright future. Some featured deer, bunny rabbits, birds, any kind of floral imaginable. Each peskira was so unique. How the ladies loved holding them up for me to see, and I "ohhed" and "ahhed" over each new "surprise." Each future wedding guest was to receive one as a wedding "favor," to wear around their necks, tied at the side. I remember kidding them that I would come back for that wedding, just to get my "favor." Of course, none of those peskiras made the trip as the Serbs fled for their lives on carts and tractors to Knin, then Bosnia. We're lucky to have these few examples of their divine handiwork. Memory Eternal! area like so many of us in the U.S.A? Because of his personal humility and lifestyle, he has been called "the saint that walks." You can read about how as Bishop of Kosovo, he was severely beaten by several youths, requiring nearly three months of hospitalization, but in the spirit of Christian forgiveness, he refused to press charges. To visit a wonderful church site that will teach you so much more about our church and its leaders, go to this websiste: SPCPORTAL.ORG. You will find photo galleries of our monasteries, costumes, icons, Serbian rulers, recipes for fasting, etc. Don't forget to come back! From my Baba Andja Mamula via my mother, Laura (Latinka) Mamula Karlo, these beautiful pieces of Serbian crocheted handiwork above. Krupa (1317) started by King Stephen Uros II Milutin, finished by Emperor Stephen Uros IV Dusan in 1346, both being from the House of Nemanja. Krka, where our bishop studied, from built in 1346 by Jelena, sister of Stephen Dusan. Dragovic was built in the 14th Century, but was later moved stone by stone during the construction of the artificial Peruca Lake. There are several other Serbian Orthodox monasteries, including Gormije, where many of the Serbs from Pittsburgh, PA. settled. The Austrians allowed the Serbs the opportunity to live in what is now present day Croatia in exchange for guarding the "Military Frontier." After a certain number of years in serving in the Austrian army, the Serbs were able to be free and granted land. The Charter for this hangs in the Museum of the Serbian Patriarchate in Belgrade. Through all their trials and tribulations, the Krajina Serbs kept their religion and deep Orthodox faith! They're EXPERT needleworkers to be able to "paint" with threads like this example of St. John the Forerunner (Sveti Jovan), shows! One of TWO blouses Dorothy Bizic brought with her from Virgin Most, Kingdom of Serbs, Croats and Slovenes when she came to America in 1930. Click image above to enlarge to focus on beautiful embroidery handwork. Here's +Dorothy Kl(j)aich Bizic in her later years, feeding her beloved geese on Valley Road in Ambridge, PA. Photo by Milan M. Karlo. Here's something even much earlier! Back row: Sons Dan and Nick, with their Father, Elia. Front row: Daughter Louise, Mother Milka, Son George. Louise is the mother of George Vurgich, Ralph Vurgich and Dolores Vignovich. 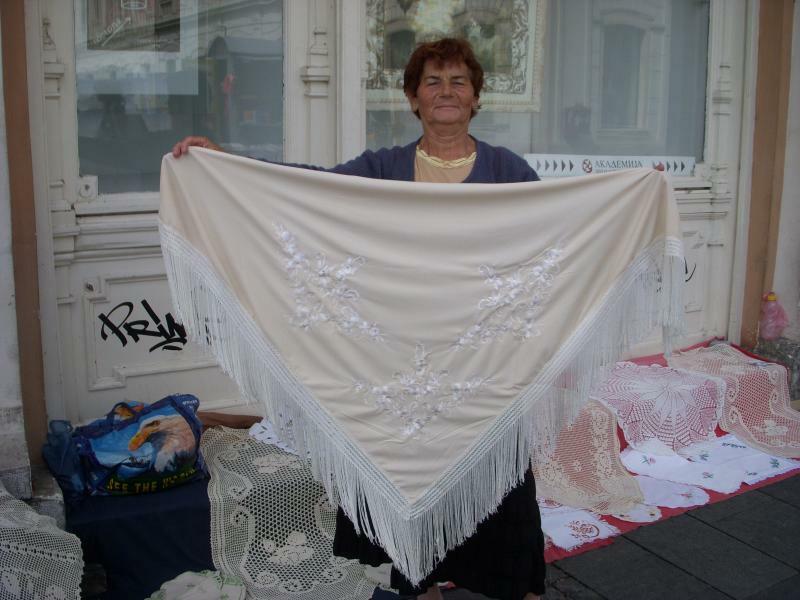 Dolores (retired school teacher) is the carekeeper of the precious blanket made by Milka in 1895. Dolores' brother George Vurgich is a retired High School Principal and Supervisor of Student Teachers from the University of Pittsburgh. Their brother Ralph Vurgich held a very responsible job with the NSA, the National Security Administration, before retiring. The blanket represents much more than a woven blanket. It endures as Milka's gifts to America..... her blanket, her children, and grandchildren who contributed so much to the warp and weft, the fabric of America! The baby on this photo, also named George, was the father of our famous general, General George Karamarkovich! There was one more son Milka had, born in 1918, Eli. But sadly, Eli died only 30 years later from TB. George (the Principal) says his mother Louise was a good mother and very hard worker. She died at age 56 in 1967 when George was 27, Dolores 22, and Ralph 20. "She never wanted anything for herself and got little recognition for her hard work. How proud she would be to know she made the www.babamim website page that goes all over the world!" George is proud of the fact that he still has the afghan she made for him and his wife Lee in 1962. The Serbian needlework represented here is just magnificent! Judy received this one as a gift from the overjoyed woman. 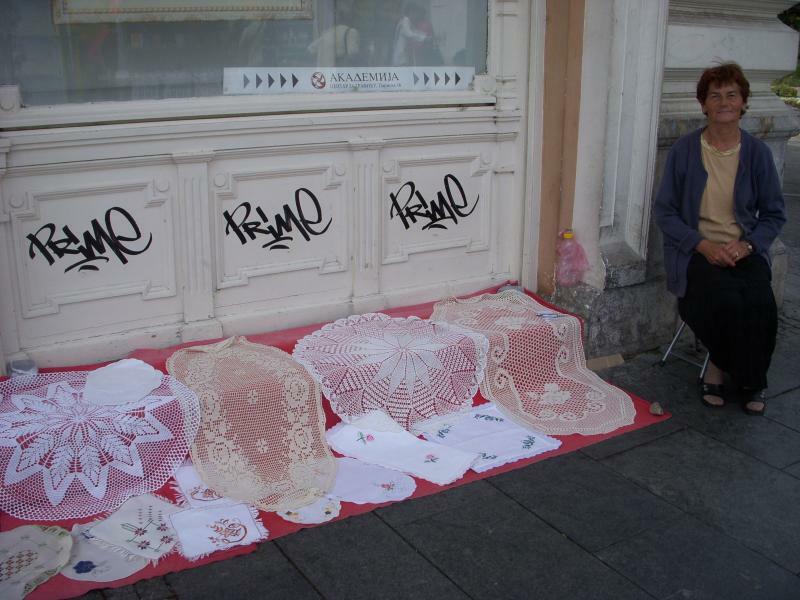 This lady was one of several selling her wares along busy Knez Mihailo Boulevard, August, 2008. There are also many vendors/sellers in Kalamegdan Park, which makes strolling such a delightful pastime in Belgrade! An umbrella is a popular way to show off a beautiful round table cover. She also embroidered this delightful shawl I purchased for my sister. This HUGE wall-sized Serbian crest was made all by hand using little flower-ettes, a stroke of creative genius! It was brought from the Krajina area to Pittsburgh, PA USA, by "Teta" Mayme and Pero Kovachevich in 1939. Click the image to enlarge. This is a "peskira" or towel used for special celebrations like Slavas or Weddings. This particular one was signed: M.B. III. Unbelievably, it was found at a Flea Market in Beaver, PA, the cost only $5.00! The peskira was folded over and all that was showing was the one line of writing on the bottom. It probably didn't make any sense to any other passersby, but as soon as I saw the Cyrillic letters, I knew, and without even opening the rest of the LONG, folded 10 Ft. linen that revealed the beautiful eagle and crest, I purchased it, "Even if it is full of holes!" I remember thinking! Imagine my surprise and delight, to find the beautiful crest design (no holes! ), complete with my initials! And like all peskiras, it had not one end design, but TWO of them! The writing on the bottom says: GRB:SHS or, Shield/Flag of the Kingdom of Serbs, Croats and Slovenes. This was probably made before 1929. 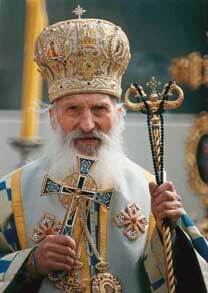 Be sure to check out the "St. George" peskira on the SLAVA page of this website too! The middle of this flag was also made by the same women from Virgin Most. It featured crossed American and Serbian flags, in front of a double-headed eagle with a crown that said "Bog Cuva Srbiju." This homemade flag was displayed in the annual Nationality Days in Ambridge in the 1970's, taken to Detroit Kosovo in 1989, and to NYC, Washington, Cleveland, and Pittsburgh, to help demonstrate against the unfair treatment of the Serbian people during the last almost 20 years. It is shown here above, Flag Day, June 14, 2008, on Toledo's Metcalf Airfield, for the fly-by honoring Arthur Jibilian (center), WWII radioman, and one of the OSS heroes, who together with the Serbs, helped rescue 512 U.S. Airmen from behind German Lines in Yugoslavia when they bailed out after bombing the Ploesti Oil Fields in Roumania. "Jibby" is prominently featured in the hardback book called THE FORGOTTEN 500 by author Gregory Freeman. More beautiful handicrafts from the Krajina Serb refugees in Belgrade. Above is of St. Elijah going up to heaven in his fiery chariot! Recognize the "SUMADIJO" embroidery in Cyrillic? The blouse Dorothy Bizic probably wore when she came to America in 1930. Close-up of the detailed embroidery on the neckline. Detail of the embroidery work on the sleeve of this beautiful and dainty "see through" blouse! Click on ALL of the above photos to enlarge and study the handiwork closer. The needlework practiced by these rural women was truly amazing! Mim Bizic wears her Mother-in-law's blouse in 2001, 71 years after it was brought to America! It was worn for the special event commemorating the 100th Anniversary of the Serb National Federation (SNF) at the William Westin Penn in Pittsburgh, PA. Mim was in charge of the Centennial Photo Exhibit that documented 100 years of SNF history. The event was captured in all of the local newspapers. The newspaper clipping above shows this one went nationwide as an AP photo! At the 100th Anniversary of (PA) Monroeville's St. Nicholas Church, I was able to photograph this rug and photo on display, made by Mildred Karamarkovich in 1895 for her baby. Mildred (Milka) was 18 years old at the time. Granddaughter Dolores says the baby blanket was made from lamb's wool and was home spun and hand loomed. It was also Milka's original design and the vivid colors are from original (natural) , organic materials. The explanation slip says Milka's dipping the yarns in the boy's urine helped preserve the yarn colors. She used the blanket with her two oldest sons Dan and Nick. She came to the U.S. when she was 32 years old in 1909 and made sure the blanket came with her. The famous Germantown Eye Dazzler Indian Rugs have nothing on Milka! to grace this page and pass onto a certain granddaughter! This cloth was also made by the Serbian Krajina refugees from Croatia now living in Belgrade. "Srce moje i srce tvoje u lubavi stoje." It's a large size, 20" x 28"
It's not embroidery or crochet, but Alex Starcevich's creations deserve to be here too! 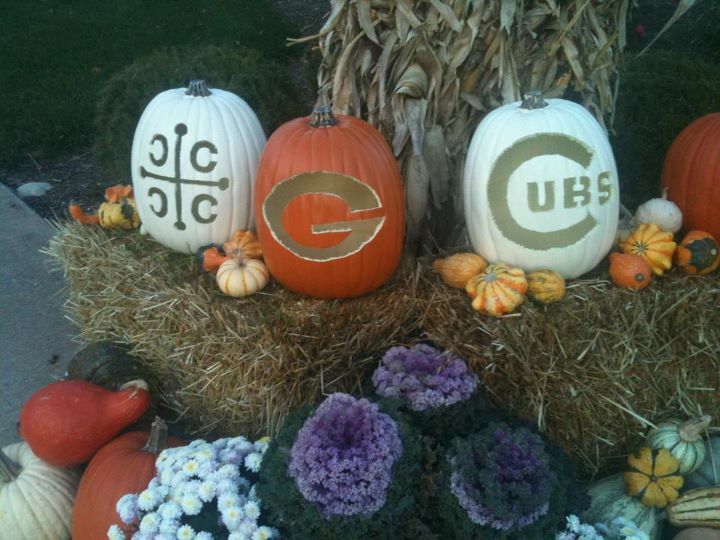 Love that pumpkin! Halloween, 2011.
crocheted large tablecloths of patterns like this one for each of her grandchildren early on in their marriages. 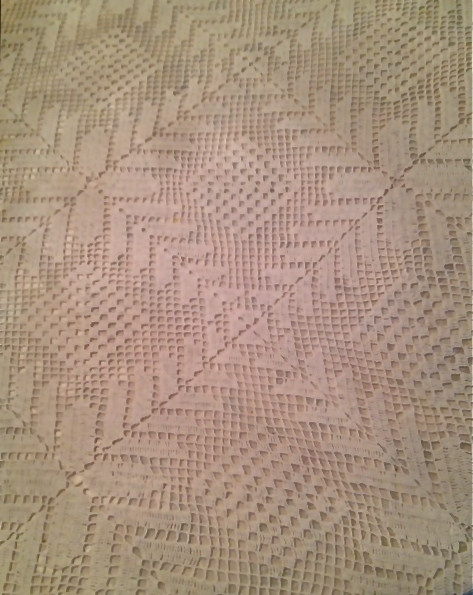 The one of the pattern shown here belongs to Mim Bizic, wife of +Gus Bizic, Milica's grandson, who has had it for over 40 years. All receivers of Milica's artistry have greatly appreciated her great handiwork ("rucni rad") all the years they have graced our dining room tables. When other Serbian artisans see this pattern on my table, they say, "You can quickly idenitfy the area from which it came. Serbian Orthodox Baba Milica Klaich was from Gornji Sjenicak region of Kordun, then in the Kingdom of Serbs, Croats and Slovenes, then afterwards known as Kingdom of Yugoslavia, the Yugoslavia. 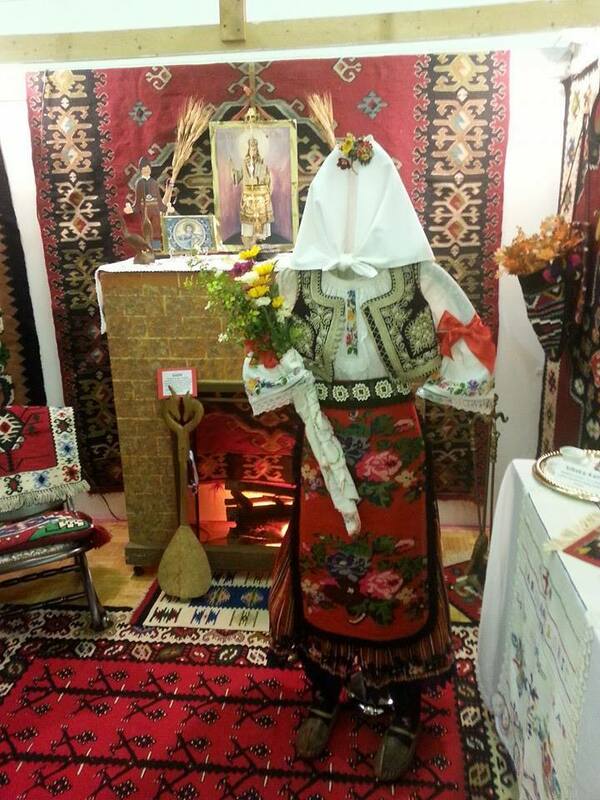 Thanks to Obrad Kesic for photographing this beautiful display of ethnographic treasures for us in August, 2014.